Tomba! is another game that I hadn't played when it originally came out, so you need not worry about potential nostalgia clouding my judgment. Instead, feel free to consider a myriad of other things that cloud my judgment! 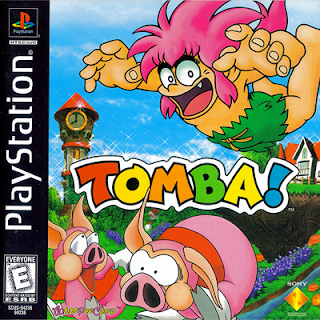 In Europe, the game is known as Tombi!, as is the main character's moniker. For the purpose of this review I will be simply calling him by his North American name. That'll do, pigs. That'll do. 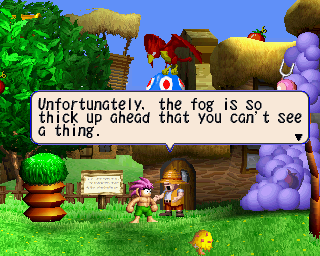 Oh, Tomba. You are yet another mascot of the nineties that was cast to the wayside, forever forgotten by most of the world. Sure, now Sony has the big guns like Uncharted's Nathan Drake, God of War's Kratos, Ratchet & Clank's eponymous duo, and whatever passes for a front man for the Killzone series, but they are definitely missing someone of notable caliber in the pink hair department. Tomba! was and still is a very original PlayStation One-era 2D platformer with loads of charm. Its recent release on the PlayStation Store has revitalized some interest in the title. Is the $9.99 USD price tag good enough to pig out on this game? Tomba! 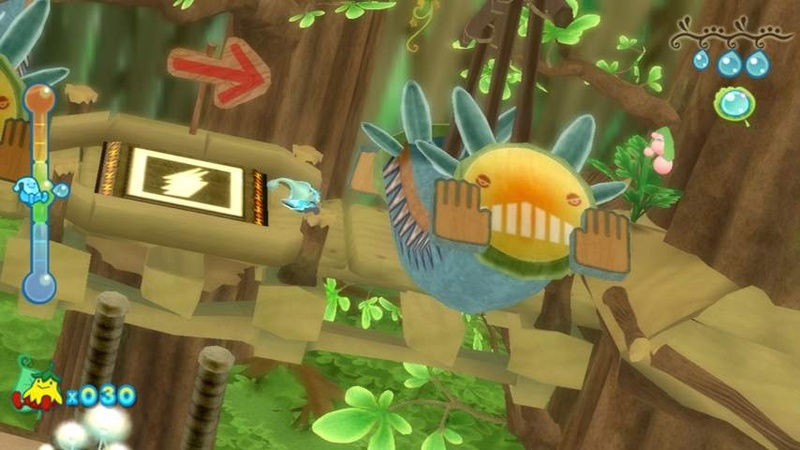 follows a simple story, and for a platformer, that's all you'd really want anyway. One day Tomba is resting in a meadow when suddenly a group of Evil Pigs steals his prized possession, his golden bracelet, given to him by his grandpa. Now, the Pigs are doing a mess of other things, other than giving Tomba trouble. 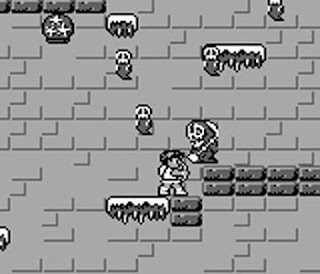 An Evil Pig has been dispatched to each main area of Tomba's playing grounds, and they are causing quite the stir. From turning the citizens of Baccus Village into rodents to create fierce winds on Phoenix Mountain, these Pigs have got to be stopped. Of course, Tomba just wants his golden bracelet. Saving the peace-loving people and habitats of the game by nabbing each and every Evil Pig to stop their tyranny over a given area of the land is just a bonus. After all, it is pretty clear from the darling opening movie that Tomba does not have all his proverbial pigs in a blanket. (I'm calling him a bit stupid and naive, for those who don't follow.) 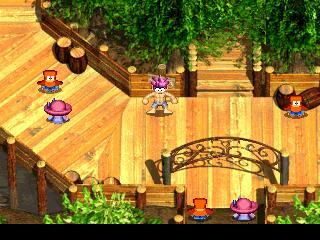 Speaking of the movies in the game, there are plenty of them sprinkled throughout Tomba's adventure. They have a cute aesthetic to them that yells distinctly "Saturday morning kids' anime." Oh, no worries - that's an adorable thing. the house (door-side) and standing on the roof. It is not just the gameplay mechanics that differ from typical 2D platformers either. No, you advance through Tomba! by completing various quests (the game calls them Events). It feels like an RPG in this regard as well as some others that I'll discuss later on. Feels, mind you. You perform tasks for total strangers or to reach certain places to earn Adventure Points (the experience points of the game) and move the game forward. Most often you cannot proceed without clearing some story-related Events. Sometimes the title of the Event is a dead giveaway of what Tomba needs to do. Other times you are left guessing and experimenting. Then, there are the Events that you simply cannot for the life of your figure out what the game wants you to do. The latter only comes up once in a while, and they are seldom mandatory to proceed in the game. On many occasions you will have multiple active Events to satisfy the conditions of. It can be overwhelming at times. So thick you can cut it with a knife. There are 130 Events in total. A fair number of them are completely optional. 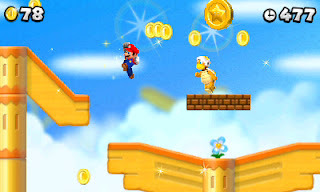 In general, the Events themselves can be as straightforward as reaching the summit of a mountain and catching a ride on a Phoenix, retrieving the pants of a monkey, or learning how to swim, or they can be as complex as combining powders to make a mysterious mushroom, helping a Baccus Village citizen stop crying, and playing hide-and-go-seek with an NPC. 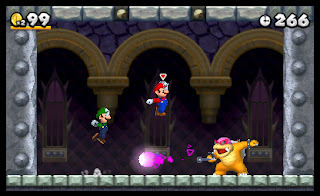 Many Events will have Tomba collecting an item to complete the quest's request. 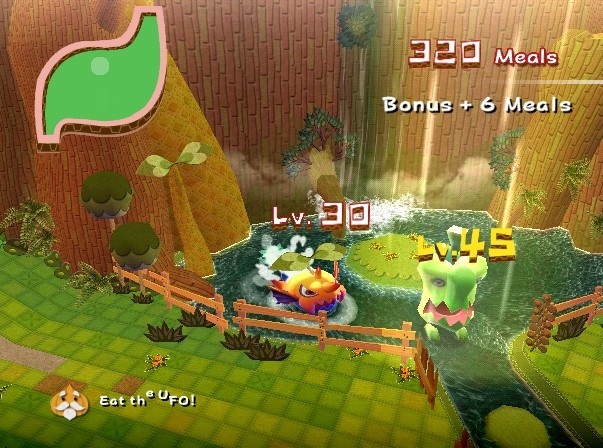 Aside from Event-specific items, Tomba can stow away in his inventory health-restoring Lunch Boxes; destination-transporting Clarity Wings (though there is a way to be able to move to any area that makes this item unnecessary); new weapons and equipment such as boomerang, grapples, parasols, and pairs of pants; and mushrooms that can turn Tomba into a happy, neutral, or crying mess. An item that our jungle boy can nab that aren't in his inventory include the invaluable Vitality Max +1, which bestows one extra slot of health for our hero. Well, at least it kills time. Along with the quest-like Events and inventory, Tomba! has another aspect of it that makes it similar to RPGs. 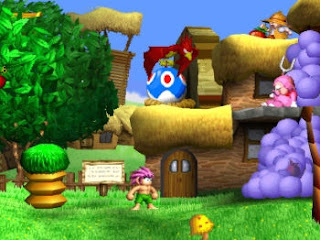 Depending on the enemy type that Tomba defeats, he gains Adventure Points (AP) in one of three meters that can fill up up to ten times. 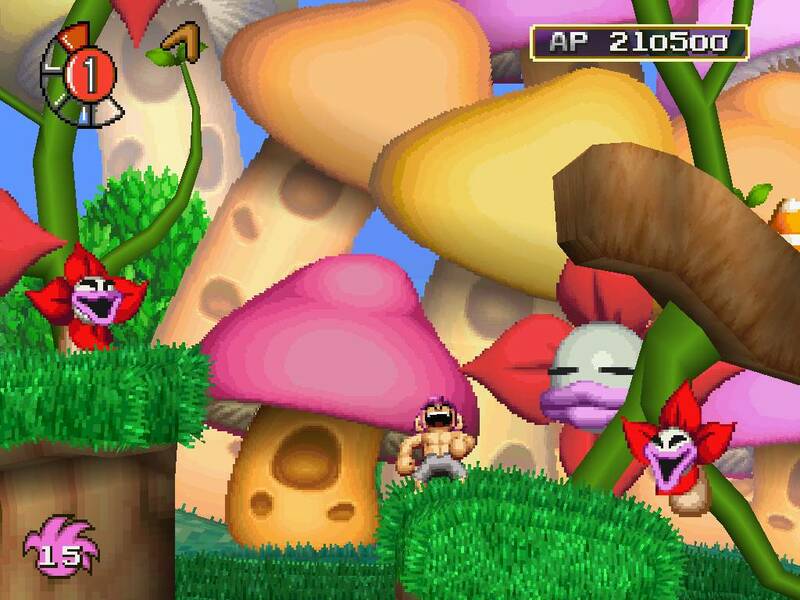 Some areas of the game are inaccessible until Tomba has acquired the necessary amount of AP. Three of the greatest treasures in the game, gems bestowing Tomba with a different power, are only able to be picked up if the pink-haired hero has the required AP gauge filled to its maximum corresponding to the gauge's and gem's color. The areas of Tomba! are all interconnected. As you can possibly imagine with all of the Events, there is a lot of backtracking involved. Apart from the 2D landscape levels, Tomba visits various towns where the game shifts to an overhead point of view, reminiscent of any typical RPG, where he can chat with the locals, get assigned new Events, and unwind. 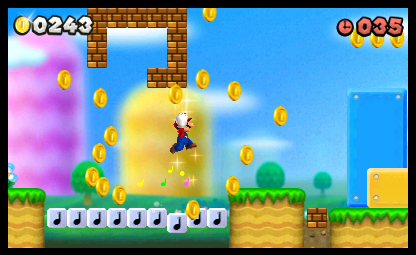 Saving is performed by walking up to the numerous signposts in the game and examining them. Eventually you will come in contact with a portal door leading to an encounter with one of the Evil Pigs. Of course, you need to have collected the Evil Pig Bag of the area first before the door is operational. Regardless, each battle possesses the same objective, jump on the Evil Pig and chuck him into the sometimes rotating, sometimes moving Evil Pig Bag to seal that oinker away for good, destroying the mystical magic spell that he placed on the area he raised heck in. This can be easier said than done as Tomba can only throw enemies left and right, and once he jumps once, he automatically tosses a foe. Add in some magic by each Evil Pig such as tornadoes, boulders, and meteors, and the challenge becomes greater. Tomba! is a good length for a 2D platformer. It took me about 10-12 hours to complete most of the Events and see the ending. I didn't get to complete several of the Events because the game glitched three of my items (three Crystal Balls) and removed them from my possession. (This seems to have happened with other players, so I am not alone, thankfully.) That said, there really is no exceptional special bonus for clearing all the quests except that you can pat yourself on the back for a job well done. some trouble for a specific area. Tomba! was criticized for its overall look even back when it released. Just imagine the complaints we would get in this climate where seemingly every thing with color is branded as "kiddy." If you still haven't evolved from thinking that you're above games because they don't feature enough violence or blood, Tomba! should be a pass for you. Regardless, I digress. How can I even mention blood with regards to such a rosy-in-exterior game? Tomba himself is rendered similar to the cast and characters of Nintendo/Rare's Donkey Kong Country trilogy, as are the enemies, NPCs, and some environmental objects. Then there's the 3D elements like the platforms Tomba hops and runs on, the walls he climbs, and some background items. It is all pretty pleasing to look at. The sound doesn't fare so hot. 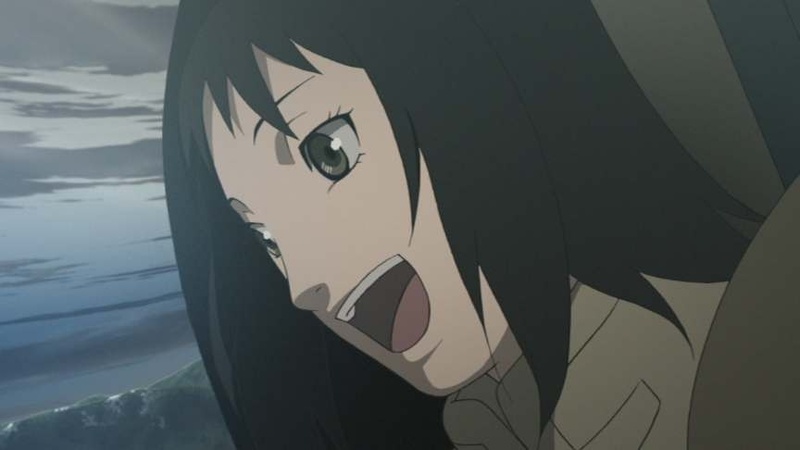 Some sound effects grate on the ears, and the soundtrack, while some songs are fine in-game, does not have much resonance or memorability. I'm sure, however, I could find one track that I liked. 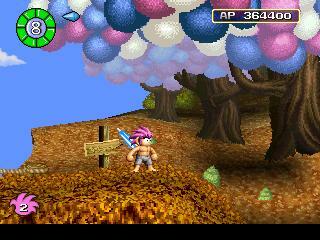 Ultimately, Tomba's first adventure is a successful one. It really is a platformer in RPG's clothing. Or maybe it's the opposite..? Nonetheless, Tomba! has its fair share of problems such as copious amounts of backtracking, imperfect hit detection, mediocre music, but for every problem it has, Tomba! is blessed with a positive. The game is charming, there are plenty of Events to accomplish, the RPG elements are refreshing for a 2D platformer, the visuals are colorful, and it has nice replay value. It is a shame the original developer of the game went out of business shortly after this game's sequel. 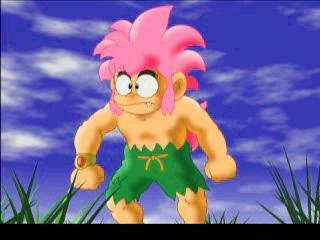 I would have loved to see a trilogy out of Tomba! Perhaps someday... or perhaps that poor, wild jungle child could wind up in a certain Sony fighting game... A man can dream. 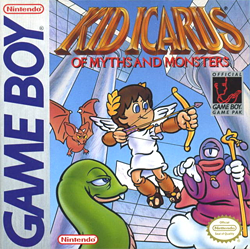 Retro Review Month flies with the help of Lady Palutena to Angel Land for our next game, Kid Icarus: Of Myths and Monsters. I take control of the precocious Pit on my journey to obliterate the Orcos menace. Having never played the game before and possessing no nostalgia, what are my thoughts on Pit's second outing? 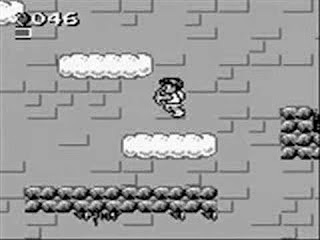 Lately, the angelic warrior Pit has been up there in popularity with some of Nintendo's mightiest mascots. This has been mostly due to his reintroduction to the gaming world as part of the roster of Super Smash Bros. Brawl and his first new starring role in over twenty years, Kid Icarus: Uprising. Uprising remains not only one of my favorite 3DS games of the year, but it is one of my favorite games of the year on any platform. That notwithstanding, I, like most likely many of you, was not familiar with Pit's past efforts with the original NES Kid Icarus (the game is available on the Wii's Virtual Console service or in 3D Classics form on the 3DS's Nintendo eShop) and the subject of this review, Kid Icarus: Of Myths and Monsters for the original Game Boy. Does this game shine in the glory of the sun, or do its wings burn up? A franchise favorite, the health-restoring hot spring! Clouds that Pit can use as platforms? Fully armed, locked and loaded. A batch of new screenshots for New Super Mario Bros. 2 have been released as the date for the game's Japanese launch approaches. North American gamers will get to get their hands on a boxed or digital copy on August 19th. For the time being, check out these ten pics from Mario's latest 2D adventure. Retro Review Month rolls on like Samus Aran in Morph Ball mode. Speaking of Samus Aran, the next game we are going to be taking a look at is a Game Boy classic. It is Metroid II: Return of Samus. 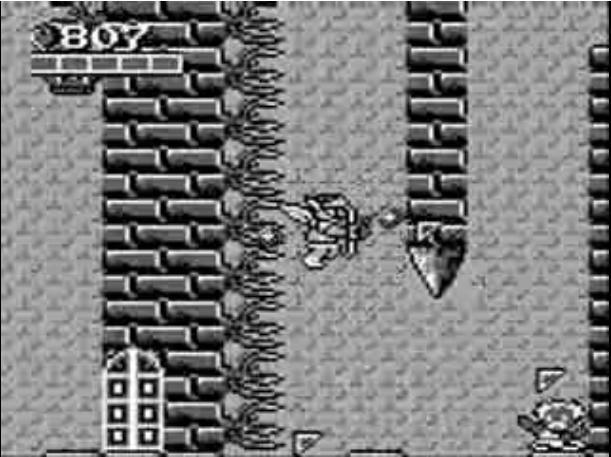 The game is considered to be the sixth title in the Metroid chronology. All that really matters is that you, the player, get to blast away some Metroids off the face of planet SR388. Is the Return of Samus a Return to Form? One could make a case to say that the Metroid games before Super Metroid aren't as thought as lovingly of as the Super Nintendo classic and the games in the series afterward. One of the main reasons and complaints is the lack of an in-game map. Back in the olden days of 8-bit Metroid, players plotted out their own maps by drawing them on a piece of paper. Still, the inconvenience of constantly pausing the game to draw a new section of the game was a serious pain that Super Metroid and games in the series thereafter rectified. 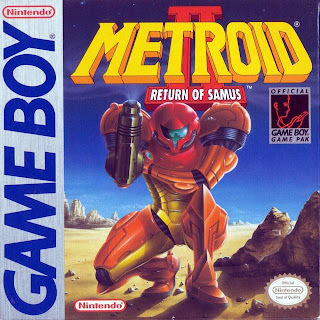 Metroid II: Return of Samus was the first handheld Metroid title. Even with having no in-game map to help players, is it still worth the adventure? Metroid II takes place on the planet SR388. The Galactic Federation had previously sent multiple extermination forces to wipe out all remaining Metroids so the Space Pirates could never use them for their own sinister plans. When absolutely none of the forces designed to take out the Metroids survive, the Galactic Federation opts to send bounty hunter Samus Aran in to complete the job. If a player didn't know anything about the plot going into Metroid II, the game certainly wouldn't help enlighten them on anything. The game thrusts players in control of Samus as quickly as they press the start button on the title screen. What little narrative that actually occurs happens near the end of the game, and it is fully playable. Samus embarks on her Metroid murder mission. The planet of SR388 is habituated by dozens upon dozens of Metroids located in every inch of the cavernous world. Samus must take out all of the Metroids in a given area to be able to advance to the next. When this happens, an earthquake will sound, lowering the lava level down for Samus to advance deeper into the planet to take on a new batch of Metroids. The actual Metroids come in all shapes and sizes: alpha, omega, zeta, etc. Each form has its own attack strategies and patterns. The first Metroid form met just slowly hovers to Samus to attack her merely by touch. 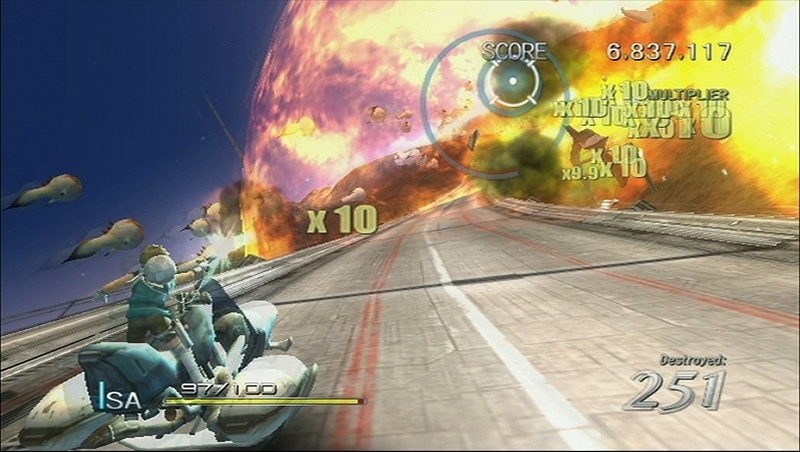 A barrage of five missiles will obliterate the pest. 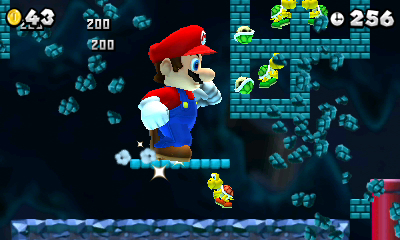 The later Metroids in the game take on lizard-like appearances, float around the screen, are fast, shoot out fireballs from their gaping mouths, and can stand up to twenty missiles before perishing. 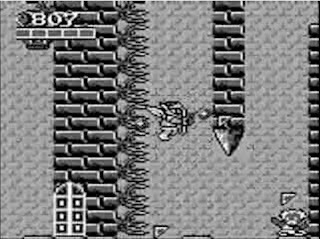 It can be difficult tracking down the last Metroid needed to move on to the next area of the game as they can be well hidden. "Don't mind me. I'm just here to exterminate you." Though as I stated already, the lack of a map is not only a consistent complaint regarding Metroid II, but it's a reason why Metroid hunting is so annoying. 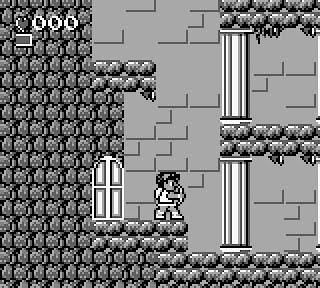 In the original Metroid, the game's rooms and corridors were different colors, so at least they could be distinguished from one another. 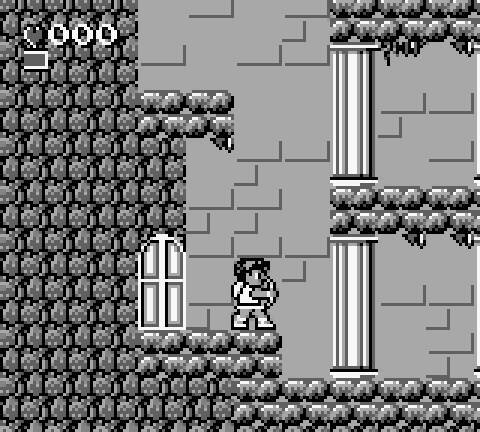 This isn't so on the black and white Game Boy sequel. Lots of rooms resemble one another, and it can be challenging to assuage which blocks can be destroyed, passed through, and which can't. I had to eventually resort to using a color-coded map to complete the game, and even then it was taxing. Like every Metroid game in existence, Return of Samus grants Ms. Aran with a bevy of new abilities to reach otherwise inaccessible areas. Returning abilities include Samus's famous and patented Morph Ball and Ice Beam moves. The Morph Ball allows her to curl up into a ball, rolling through narrow passageways as well as dropping bombs to blow up blocks and enemies. But that's not the limit of the Morph Ball's abilities this time around. Samus can learn the Spider Ball and Spring Ball powers. The Spider Ball allows her to stick, scale, and cling to walls whereas the Spring Ball gives her the chance to jump while in Morph Ball form. 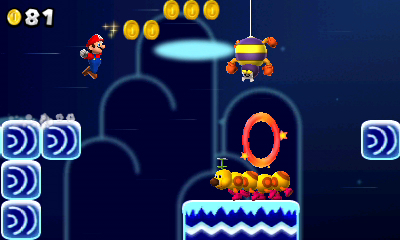 A series mainstay, the Space Jump, makes its debut to the franchise in this game. By timing Samus Aran's jumps carefully, she can leap infinitely, though practice makes perfect on that one. These statues hold each of Samus Aran's new abilities. There are also numerous missile expansions and health-increasing extra energy tanks strewn about SR388. Unlike most games in the series, there is no completion percentage achieved by nabbing a certain amount of expansions/energy tanks. 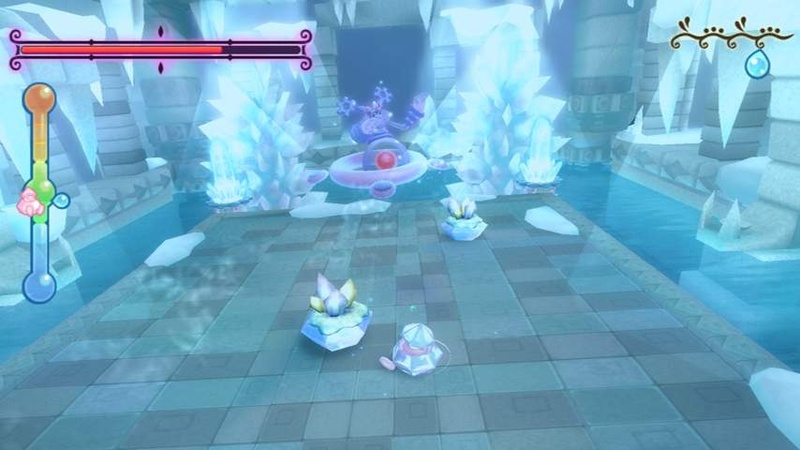 Instead, the only facet of the game that is judged is a player's time to beat the game (the best ending is achieved by reaching the end of the game in less than three hours). That isn't to say that collecting these goodies is without a doubt useless. If one wishes to have a fair shake at survival, these become a necessity - unless that player is really firing on all proverbial cylinders, of course. With the scarce amount of save points in the game and the incredible amount of damage Samus can take from Metroid assaults, players will need all the help they can get. Though the save point issue fixes itself if the Virtual Console version (available on the Nintendo 3DS system's eShop) is played thanks to its save state functionality. Some rooms are carbon copies of others. This makes for some befuddling moments. Metroid II suffers from being on the Game Boy. A significant portions of the rooms look alike, causing lots of confusion to the player. That said, the visuals are astounding. Samus herself takes up more real estate on the screen than in her original Metroid days, but this doesn't really affect the gameplay all that much. Regardless, it amazes me what was done on the simple and humble Game Boy. The sound, too, shines in some aspects, while it falters in others. The music starts off with the feeling of the beginning of a grand adventure, but in later areas it feels entirely atmospheric, driving home the point that Samus is indeed on a mission alone, isolated from humanity and fully immersed in danger. Not all is great on the sound side, though, as there is a sound effect that is heard every time Samus jumps. It gets grating after a while, especially in areas with subdued or no music playing. Metroid II: Return of Samus is nowhere near my favorite entry in this science fiction action adventure series. I'd be amiss, however, if I said I did not enjoy my time with the game. Sure, I had to use a pre-made map to get my bearings throughout my journey through SR388 - finding and eliminating the Metroid menace far and wide, but Return of Samus is a game that I can see myself returning to - constantly trying to speed run through the game, scoring excellent times, and obtaining the best ending. If you are interested in seeing the Metroid series's roots on a portable gaming device, Metroid II: Return of Samus is the perfect game to do so. I greatly enjoyed the eccentric Freakyforms: Your Creations, Alive! when it debuted on the Nintendo eShop in the latter half of 2011. Now Europeans are getting a retail version of the game with more parts to create Formees with as well as a new dungeon mechanic. Freakyforms Deluxe debuts in Europe on July 28th. Darksiders was a game that came out of nowhere and became a sleeper hit. The new Death Comes to Us All trailer for the upcoming sequel shows off a lot of the antagonists of the game as well as some high octane action. Darksiders II rages war next month, with the Wii U version coming out later alongside the console's launch. The Nintendo Wii is a system that I believe will be thought of more fondly in the future. As of right now it is a popular lightning rod for hatred from a certain sect of gamer. The main argument is that the console has a limited amount of compelling games. Well, that couldn't be further from the truth. It's almost as if these gamers only consider big blockbusters to be worthy of their attention and not the smaller, more niche software. This list focuses on the latter. These are titles that not only received little to no publicity (except maybe outside of the occasional one page magazine advertisement), but these are ones that you may not even know exist! It's important to note that I obviously have not played every Wii game in existence, so if your favorite game that you believe no one outside of a small percentage of people have heard of isn't represented on this list, don't be offended. These are the games that I am most familiar with. Welcome to Kawawii Island, your virtual getaway destination with four specific resorts to explore and play around in: Marine, City, Snow, and Mountain. 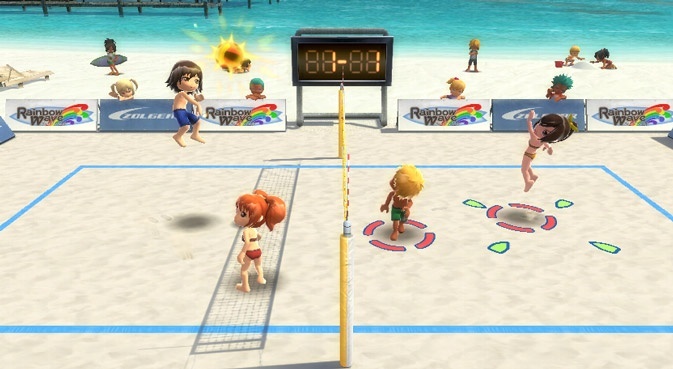 Go Vacation is essentially a mini-game collection that strives to be much more. For instance, the various resorts you visit act like a sandbox. You can find and participate in unique activities like ATV races, jetski competitions, tennis, equestrian games, scuba diving, skydiving, skateboarding, mini golf, and many more. Some activities control better than others, but the majority of them exude plenty of entertainment. Journeying across the four resorts offers plenty of opportunities for exploration including uncovering hidden treasure chests that contain gear for your avatar character, photo ops, missions to complete, and other optional tasks. 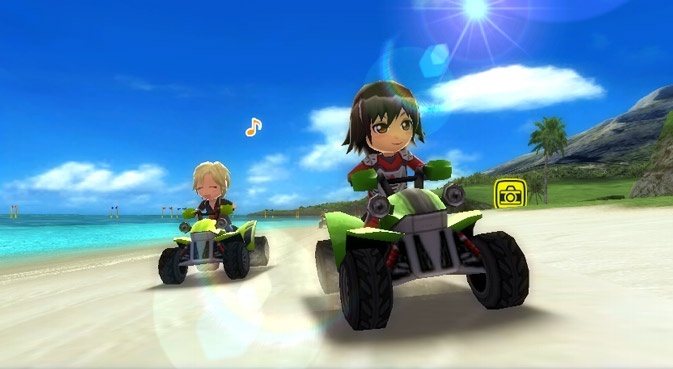 The game focuses heavily on customization as well. You can earn silver keys from finishing off all challenges for a specific activity to unlock different types of furniture for your villa. From getting your interior decorator on with villa creation to personalizing the look of your in-game avatar, there's plenty of room to show off your creativity. Then there's the clean presentation of the game and the absolutely infectious music. Sometimes soothing, sometimes something from 80s pop, it all sounds terrific. Go Vacation sold relatively well in Japan - it even received an Iwata Asks segment. Unfortunately, the sales didn't carry over to North America. From the team behind the Ace Combat series, Project Aces made a companion game to The Sky Crawlers anime movie. As you can probably guess since Project Aces is aboard, the high flying dogfight-ing turmoil of Innocent Aces is quite high. 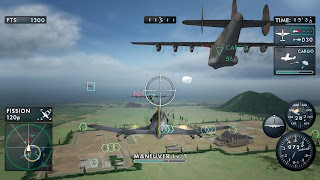 Whether your mission is to obliterate all enemies from the sky, take out specific targets, or defend a supply freighter or friendly base, you have a heap of aerial action to satiate your thirst for high octane heroics. 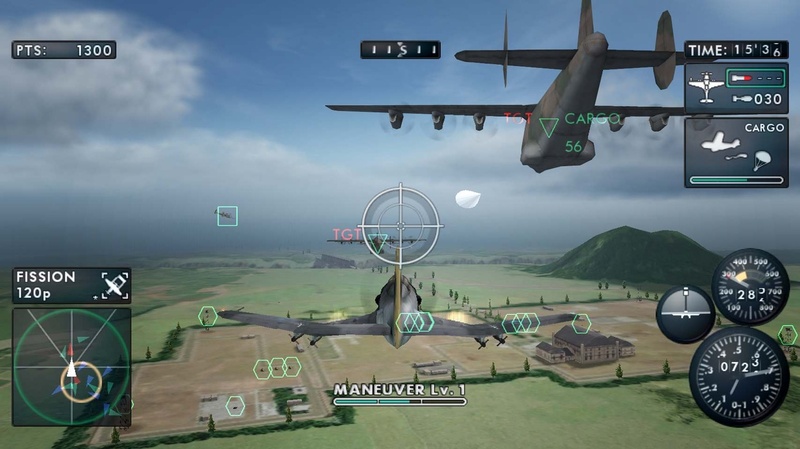 There are several plane types that you are assigned to using on special missions that add some artificial difficulty to the game, such as having to use a horrible to maneuver aircraft in Senryu to save your squadmates with a panic-inducing strict time limit to boot. The difficulty is uneven throughout the game, but overcoming it yields great rewards as the gameplay is just so brilliant. Taking down enemy fighters with TMC moves or Tactical Maneuver Commands allow you to shoot down foes effortlessly and while doing so in style. Primary and secondary weapons for each aircraft offer alternative methods to achieve your quota for destruction. Apart from the flying, you might find yourself just soaring around the skies freely just to marvel at the magnificent music and surrounding locales. The Sky Crawlers: Innocent Aces released at the price point of $30 USD, so it is bound to be even less now. 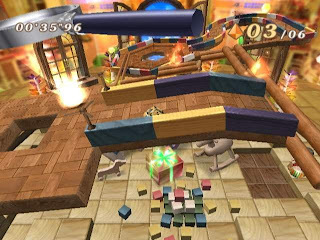 Following the lead of Sega's Super Monkey Ball series, Hudson Soft's Kororinpa: Marble Mania has players tilting and rotating the Wii remote to maneuver the simple-at-the-start, complicated-later-on levels of the game. It sounds like child's play, but things become much more challenging later on down the line when a player has to deal with moving platforms, narrow pathways, and an abundance of rail-free sections of levels. 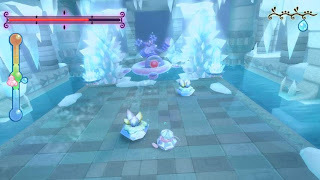 The object of each Kororinpa level is to collect all of the colored crystals to unlock the goal which the player must then reach. There are over 50 unique levels in the game to become victorious on as well as to master. Players earn trophies based on their time besting a level, either gold, silver, or bronze. 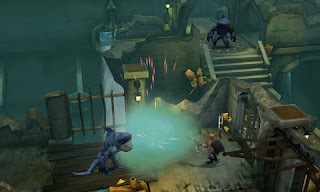 After a round of levels has been completed, players are whisked away to new level types with different environments. From tranquil gardens to sickening sweet confectionery delights to roll your marble on, there's no shortage of locales to be had. 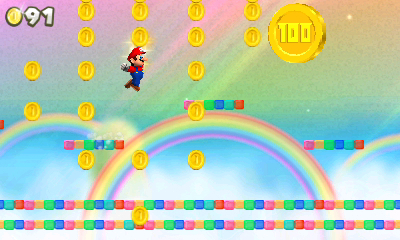 Unlockable marbles each with their own stats and secret, much more arduous levels add to the replay value of the game. 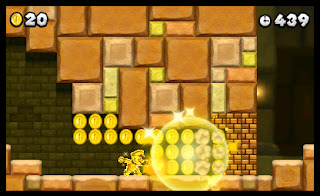 A sequel would be made called Marble Saga: Kororinpa, which would allow players to devise and create their own levels. 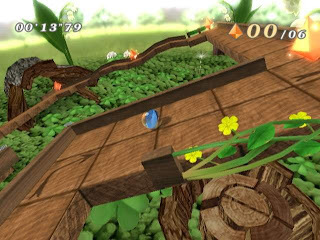 The reason I chose the original Kororinpa is because that of the two games, Marble Mania is considered the rarer of the two, thus giving it more of chance that many haven't heard of it. After a near launch title for the Wii in Elebits (which one could argue deserves to be on this list as well) was completed, the development team began work on a totally different project and new intellectual property starring a dew droplet appropriately named Dewy. Dewy's Adventure follows the cutesy water droplet as he tries to abolish the threat of Black Water from the land. The game uses the Wii remote held horizontally and has players tilting it to move Dewy around. Sometimes it can feel like you're sliding him around like butter on a hot skillet, but more often than not this works. Dewy isn't your ordinary living droplet of water either. He has the power to affect the weather. Many times these powers allow him to advance in the various worlds and levels in the game by solving puzzles and taking down large groups of baddies. He can create strong winds that put some foes to sleep. He can summon disastrous earthquakes to destroy boulders in his way, and he can turn to ice to freeze bodies of water, allowing Dewy to cross them without worry. Experimenting with Dewy's various forms is always recommended for when players reach a dead end. I proudly have my Dewy pre-order plushie presented on one of my shelves. I know the game did not receive its fair share of fanfare - and Konami is much less willing to risk money in unsure ideas - but I would love to see Dewy return to the gaming landscape. At its outward appearance, We Love Golf! is a standard fare Japanese-centric golf game containing an abundance of colorful anime-esque characters and bright and cheery courses. Delving more inside the core of the game, you realize that We Love Golf! is a remarkably deeper and more rewarding game than you first realized. Tournament mode puts players against a field of 29 names who all vie for the spot of number one as they play 18 holes of a given golf course. The player with the best score at the conclusion of 18 holes is deemed the champion. There are three difficulties with regards to Tournament: the regular Tournament, the more sloped greens and tougher conditions of the Pro Tournament, and the agonizingly challenging Mirror Tournament. 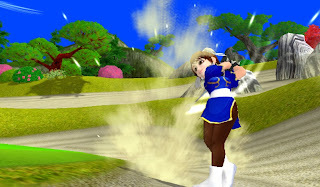 At the start of the game, your choices of courses and golfers are limited, but by the end of the game you have eight courses (not including the three short courses) and a dozen or so bland golfing personalities (though the personality problem is lessened when you unlock Capcom-themed costumes for your characters such as Apollo Justice, Arthur from Ghost 'n' Goblins, and Chun-Li of Street Fighter fame). Unfortunately, I can only imagine that the publisher of the game, Capcom, was banking on Nintendo fans buying the game solely because Camelot developed it. This did not happen. Even with its addicting and rewarding gameplay, bounty of unlockables, online play, and clever course design, We Love Golf! was mightily overlooked and uncelebrated by Wii owners. 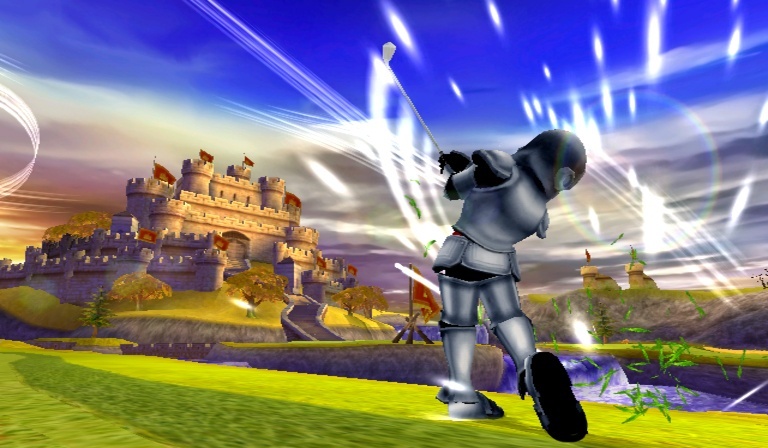 In fact, I surmise that more Wii owners know of Super Swing Golf than Camelot's wonderful golfing game. I hesitated to put this game on the list because it has been the subject of a metric ton of sales, usually putting the game around the extraordinarily-worth-it five dollar price point to pick up. The original Sin and Punishment released on the Nintendo 64, but it was only available in Japan up until the game came out on the Wii's Virtual Console service in late 2007. The game was 100% true to the original game. Sin and Punishment: Star Successor is the first sequel of that Nintendo 64 classic and the first to get a retail release in the west. 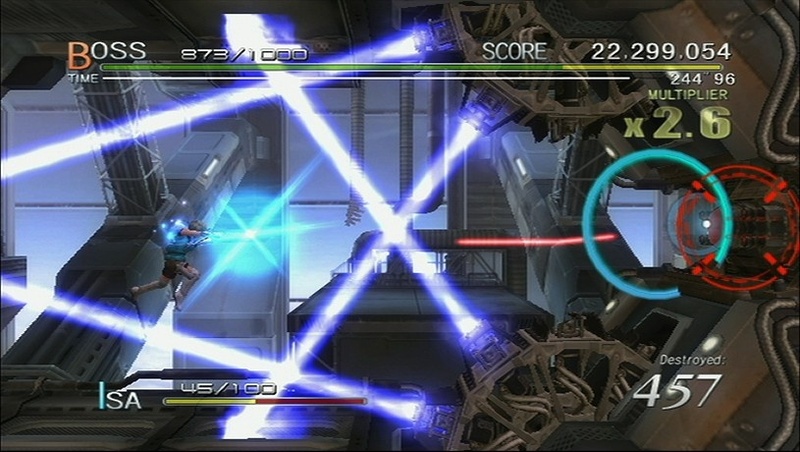 Players take on the role of either a boy or a girl in this 3D shoot 'em up. 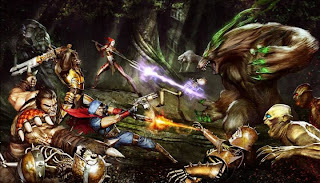 Players zoom in and out of areas, bombarding baddies with blasts and melee attacks to send their shots back at them, and battle big bosses with most levels consisting of multiple encounters with more powerful creatures. This Treasure-developed game rewards players with not getting hit by increasing their score multiplier. Some serious scoring can be done if one doesn't lose their multiplier by taking damage. Scores can even be compared online on the leaderboards, so it's great to literally shoot for number one. If you don't like aiming by pointing at the screen with the Wii remote (why you wouldn't is beyond me), you can opt to use a GameCube controller or use the Classic Controller. From discovering a boss's weak point to the adrenaline rush of carefully dodging a flurry of fiery shots, Sin and Punishment: Star Successor is a terrific title. It's just a shame that Nintendo of America let it slip through the cracks instead of letting people know more about the game. That notwithstanding, I guess we should be glad they even decided to localize the game, judging by their recent history. 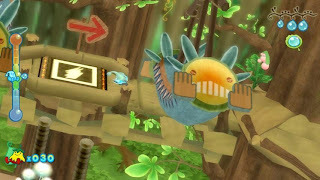 Fishing Resort was developed by Prope, a studio founded by Sonic the Hedgehog creator Yuji Naka.While his games after leaving Sonic Team and Sega have not been significant sellers, the originality and quality of each game has been pretty much all top-of-the-line. 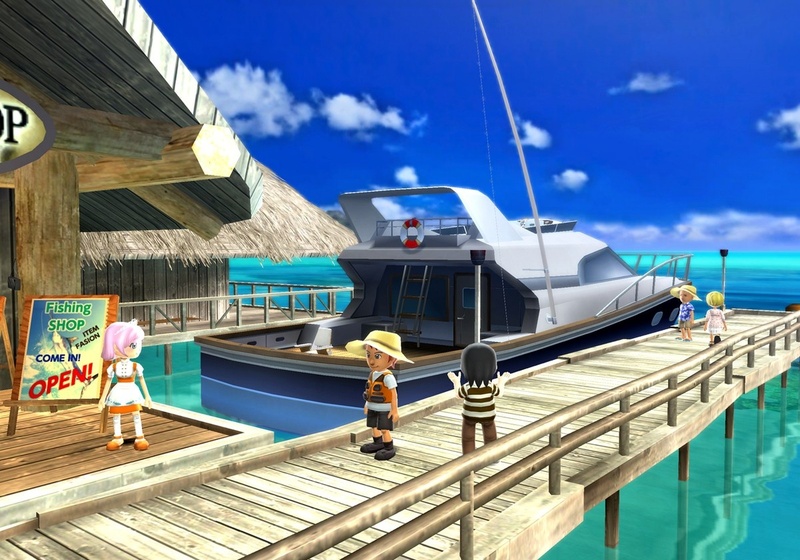 Speaking of lines (at least in regards to fishing lines), Fishing Resort puts players on a vacation-like island full of different locales. Fish in the steamy jungle, go ice fishing on the island's tall glacier mountains, or just relax by the beach for some good ol' fishin' fun. 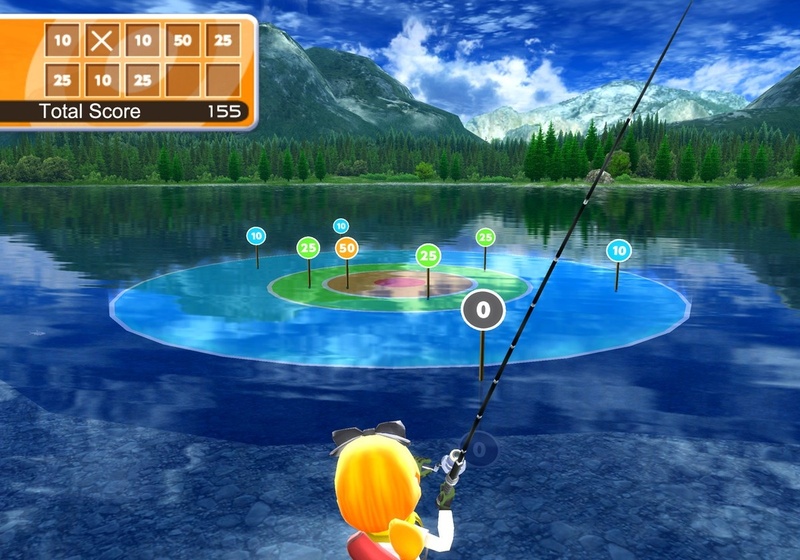 The actual fishing has players casting the line with the Wii remote and reeling fish in by performing circular motions with the nunchuk. It can feel like an exercise when one is trying to nab something as ferocious as a ten-foot barracuda! Also, there are twenty or so fishing-related mini-games such as casting one's line to fall within a target with varying scores based on how close they reach the bull's eye. In addition to the mini-games, players can also strive to catch the hundreds of fish types to add to their collection or give to the local aquarium. There's even online leaderboards as well as local play for up to four anglers to try to determine who is the top fisherman. The customization is also very nice, allowing players to dress up, equip themselves with the best bait and rod for the right occasion, and personalize themselves as they see fit. Fishing Resort released late last year (with or without a special peripheral), and it sort of got away from most gamers like a tough-to-catch fish. Based off the game by Kenta Cho, Tuniki Fighters, Blast Works' gameplay is a 2D shoot 'em up with a twist. Destroyed enemies can attach themselves to the player's ship, allowing them to act as either extra protection or even extra offense. For example, if a defeated enemy with a cannon falls onto the player's ship, it will intermittently fire at foes as long as it is in commission. This gameplay element serves as something refreshing for a game that might be considered stale without it. But then these people who might consider it stale otherwise haven't met the exhaustive editing tools Blast Works possesses. 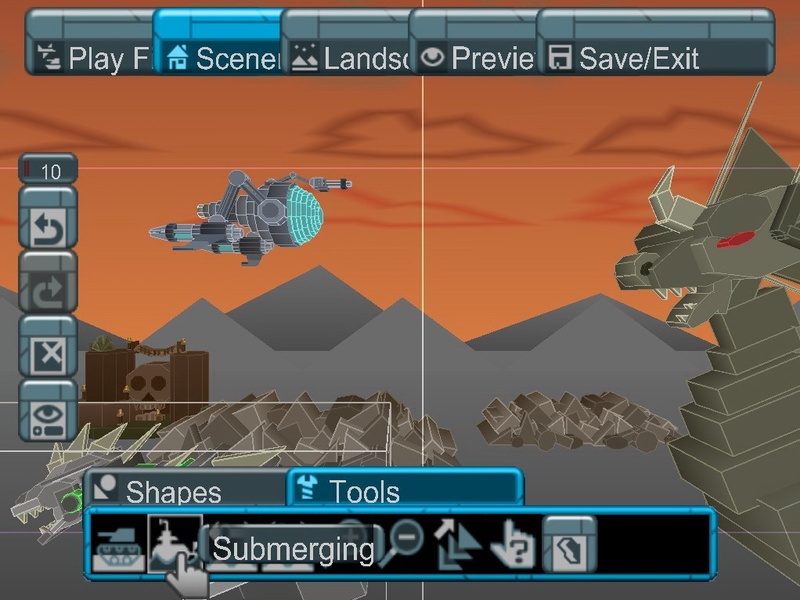 Players can build their own fighters, enemies, buildings and other architecture for backgrounds, and design their own levels. Or, if one lacks the creative touch to design something wholly original, they can edit already created assets and add a personalized touch to them. These creations could be shared on the official Blast Works site and be shared via the seldom used WiiConnect24 function. 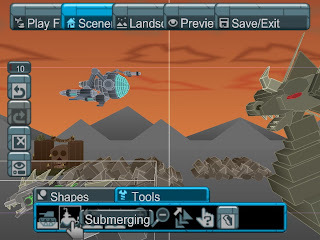 Blast Works is like the LittleBigPlanet of shoot 'em up games with a ton of customization and the gameplay to back it up. For twenty dollars (USD) at release, the game was a brilliant bargain. It still is today. 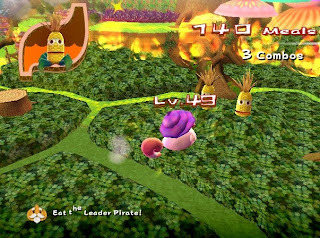 Alluding to another one of Namco Bandai's games, Katamari Damacy, the goal of each level in The Munchables is to try to grow your hungry mascot as large as possible. The main attraction to The Munchables is to gobble up enemies. Each level, you start fresh. A predetermined size is given to you at the beginning of a level. Your size is indicated by a level number. You can easily eat up smaller enemies, but if an enemy has a higher level than you, your Munchable won't be able to fit its jaws around it. 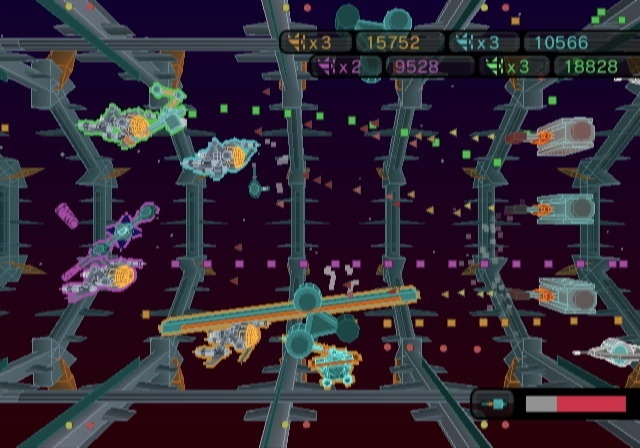 In this case, you have to attack the enemy so it will divide itself into smaller, lower level enemies. For each enemy you digest, you earn a meal point. These are totaled up at the end of the level to reward you a letter ranking based on your performance, up to an "S" ranking. In order to maximize your meal counter, you'll want to go to town on several space pirates in a row. The more you eat in a continuous manner without taking much of a breather, the higher the meal bonus you'll acquire. You can hold down the chow down button to charge at enemies with your mouth open for a relatively swift way to digest a myriad of adversaries. 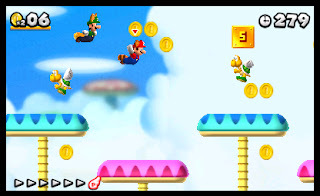 There's eight worlds to complete, each with three stages. The third of which is always a boss battle against a food-related foe like a bad piece of broccoli or a sour attitude vine of grapes. Even after the game is completed, a mirror mode unlocks. 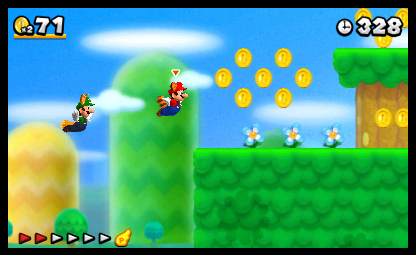 Then there's unlockable costumes and secrets in each level to discover. The Munchables will no doubt satisfy your craving for something colorful and fresh. Additionally, The Munchables was so overlooked by gamers that SuperPhillip Central was actually the first place to review the game. That's saying something. In the world of Excitebots: Trick Racing, obtaining first place is not good enough to win. No, no. You have to win in style. By choosing one of many already unlocked or secret bot vehicles which range from a rat to a lobster, players speed through tracks strewn across the world and even in space. Through each of a given race's three laps, players must earn stars through doing a bevy of cool tricks and stunts such as spinning multiple times in midair, smashing into another vehicle, kicking a field goal through the uprights, scoring a soccer goal, knocking down ten bowling pins to achieve a strike, collecting a group of butterflies, playing the role of a daredevil and flirting with danger by passing through a narrow path surrounded by trees, and other incredible feats of amazement. For every successful trick or stunt a racer pulls off, they earn stars (a bonus of stars is rewarded to first place). The racer with the most stars at the conclusion of a race is determined the victor. Excitebots is a tremendous arcade racer that will certainly get the adrenaline going. One might think that using the Wii remote to steer and perform tricks would be - for lack of a better word - tricky, but that honestly couldn't be more of a folly to believe. The racing feels absolutely sensational, and I couldn't imagine playing the game with a regular controller. The level of fun would be lessened. 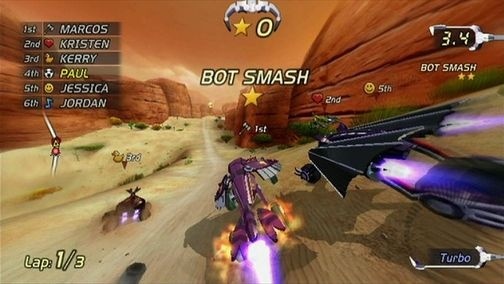 Excitebots: Trick Racing was released with no applause or recognition on its release - not even by Nintendo. 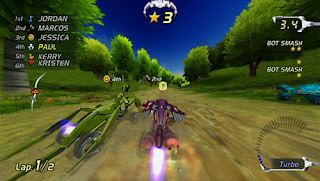 It never even made it to Europe, sadly, so Europeans missed out on a stellar racer, though they did get to experience the launch game, Excite Truck, which Excitebots is a spiritual sequel of. Excitebots: Trick Racing is definitely worth a look as it has a remarkable sense of speed, action, entertainment, great online, and loads to unlock. The Wii library is so robust that there are plenty of other titles that I would have liked to have listed here but could not because of the ten game limit. I am referring to titles like A Boy and His Blob, Endless Ocean and its sequel, MySims Racing, Opoona, Zack & Wiki: Quest For Barbaros' Treasure, MLB Power Pros, and a wide assortment of others. The Wii truly has a tremendous library, given you take the opportunity to banish the preconceived notions of the system you might have and actually attempt to give the library a chance. This year I have found a new franchise that I am in love with - Ys. Its pure action-RPG gameplay made me enamored with Oath in Felghana and Ys Seven. Now, the tradition continues with the PlayStation Vita exclusive, Ys - Foliage Ocean in Celceta. 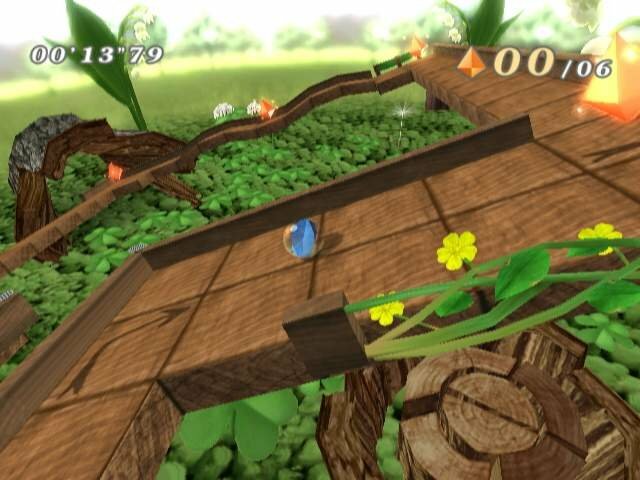 Instead of having a camera locked overhead, it now follows behind the player, similar to something like The Legend of Zelda: Ocarina of Time or Final Fantasy XII. Watch this action-packed trailer below. Last week, Heroes of Ruin finally released in North America. 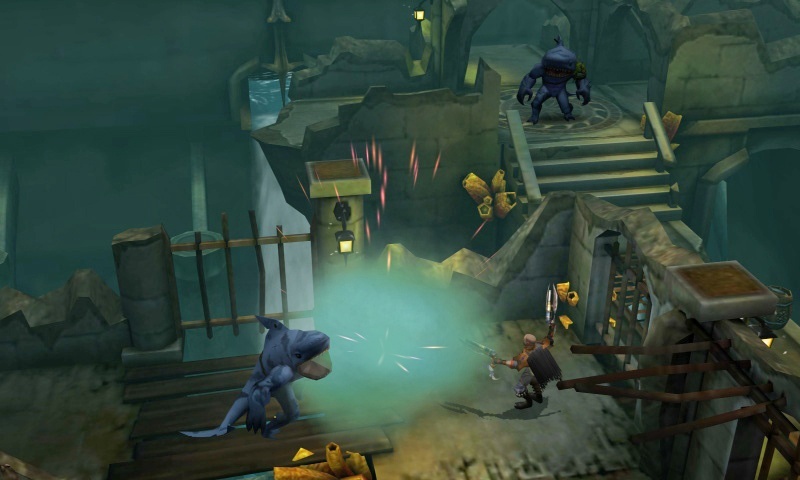 The game supports up to four players exploring the various dungeons locales, doing away with unsettling monsters, and collecting that all-important loot. Four classes, online play with voice chat, and drop in and out co-op make for an enticing package for prospective players of the game. I recently had the chance to ask the fine folks at n-Space, the developer of Heroes of Ruin, such topics as their inspiration for the game, the possible inclusion of patches and downloadable content, and their thoughts on the future of the Nintendo 3DS and the Wii U. If you're unfamiliar with the developer, the team has created such games as Geist on the GameCube, various Call of Duty ports on the Nintendo DS, and is currently working on the Nintendo 3DS version of Skylanders: Giants. SuperPhillip (SP): What inspired you to create Heroes of Ruin for the 3DS? n-Space (NS): Heroes of Ruin is our contribution to a genre that we love and respect: action adventure games that are heavy on leveling and looting. 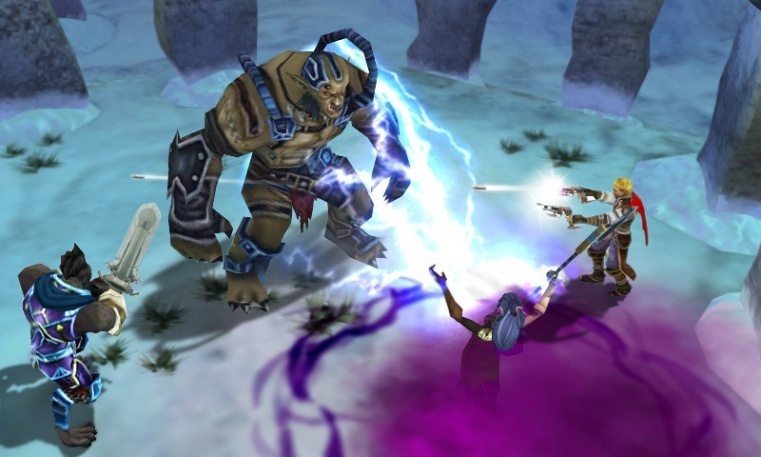 Titles like Diablo, Dungeon Siege and Marvel: Ultimate Alliance were among our key sources of inspiration. Our base concept, though, was to bring to the Nintendo 3DS the most robustly featured game in this genre that’s ever been developed for a portable system. That concept not only excited the development team — it excited Nintendo 3DS owners across the globe. SP: The Heroes of Ruin demo was impressive. I can only imagine how the full game will be. Were there any problems in development with fitting the whole game (graphics, content, amount of loot, characters, dungeons, online functionality) onto a 3DS game card, much more pushing the 3DS system itself to run the game? NS: Your readers might not know that Nintendo 3DS game cards come in different sizes to accommodate games of varying scope. The game card for Kingdom Hearts 3D, for example, is much heftier than the game card for Bust-A-Move Universe. We worked diligently to keep Heroes of Ruin as lean as possible so that it could fit onto the smallest 3DS game card. In some ways, it was a struggle to meet those limitations, but this process helped us learn quite a bit about maximizing our resources. And it was good for us to challenge ourselves in this regard because that ultimately meant we had all the more reason to be proud of the game! SP: Did having the stereoscopic 3D of the Nintendo 3DS necessitate a change in approach to development similar to how, with the shift to 3D, filmmakers had to change their approach to how they shot scenes? Did the 3D effect make some things possible to do which would have been impossible otherwise? NS: Our experience might not have been as radical a shift as what 3D filmmakers faced, but the new capabilities allowed us to enhance Heroes of Ruin in ways more subtle and sublime. 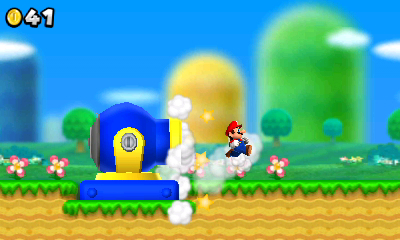 For example, you might see an environmental object momentarily come between you and your character. This kind of overlap is possible with any system that accommodates layered displays, but it yields an enhanced sense of depth when done correctly on the Nintendo 3DS. That’s why we regard stereoscopic 3D as the next step along the path of fully captivating and involving players. SP: Is it possible for Heroes of Ruin to get patch support for things like glitches, bugs, exploits, higher-level caps, oversights, etc? And if so, are there any plans to do so? NS: Glitches? What are you talking about? Heroes of Ruin is flawless — just like every other video game that’s ever been released! In all seriousness, though, Nintendo has greatly empowered developers and publishers with the Nintendo 3DS eShop. It was encouraging to see Nintendo release the Mario Kart 7 update eliminating the Maka Wuhu shortcut, partly because we’re huge Mario Kart 7 fans and partly because that demonstrated how such updates could be delivered. So the possibility is there. 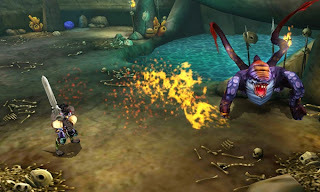 As far as what updates might be done for Heroes of Ruin, if any, that’s an ongoing discussion. 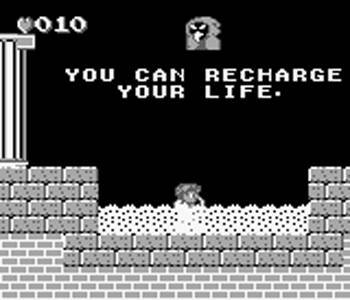 SP: I know at the latest Nintendo Direct for Europe that it was revealed that Heroes of Ruin would have free daily challenges for a year. Could you go into more detail on what kinds of challenges will be available and how deep/complex they are? NS: There are actually two types of challenges offered in Heroes of Ruin. Daily challenges, which are delivered by Square Enix, are unique to any given calendar day to ensure players can constantly enjoy fresh experiences. In addition to these offerings, Square Enix will coordinate weekly challenges. These will afford players a bit more time to earn the Valor that can be exchanged for more powerful weapons and armor. So how exactly do you earn Valor? One challenge has you hunting down five wolves in the Elder Forest. Another challenge tasks you with killing four enemies in four seconds. There’s a wide variety that will keep players of all skill levels engaged. SP: Do you currently have any plans to add DLC in the form of new dungeons, character classes, etc? NS: That’s a tricky question to answer. If you look on the Heroes of Ruin box, you’ll notice an absence of the orange Nintendo Network logo. This means the game in stores doesn’t offer the option to purchase paid DLC. But that’s not necessarily the final word on the subject. We don’t have anything to announce at this time, but if your readers would like to see paid DLC, they can make their voices heard at the HeroesOfRuin.com message boards. Square Enix keeps a pretty close eye on that dialogue. SP: Is it true that Nintendo assisted in development of Heroes of Ruin by unlocking more of the 3DS system's power? If so, how did that help development? NS: Nintendo did help us, but not exactly in the way that’s been reported. There’s been a bit of confusion on this point, so thank you for allowing us this opportunity to set the record straight. At one point last year, Nintendo released an updated software development kit for the Nintendo 3DS. This new kit granted us and other developers new access to the system’s second processor, essentially unlocking for us some power that Nintendo had previously held in reserve. In our case, we applied these new resources toward some of multiplayer aspects within Heroes of Ruin, such as Wi-Fi communications. So while Heroes of Ruin benefited from the updated software development kit that Nintendo released in 2011, that kit was not released specifically for Heroes of Ruin or given exclusively to us. It’s easy to see where the confusion could occur, but it’s a distinction worth making. SP: Speaking of Nintendo, what potential do you see in the 3DS's future and the company’s next console, the Wii U? NS: Consider how much the Nintendo 3DS has accomplished in its first 18 months. It’s hosted games in the Resident Evil, Metal Gear and Dead or Alive franchises; it’s delivered incredible experiences from smaller studios, such as Mutant Mudds from Renegade Kid; and it’s helped redefine what we can expect from a portable system with unique features like StreetPass. And again, this is just the first 18 months. Can you imagine the incredible games and experiences we’ll be discussing two years hence? The Nintendo 3DS offers an amazing amount of potential and we’re very eager to see what we and other developers can achieve. Similarly, the Wii U also has us very excited. We saw at this year’s E3 some very innovative and exciting uses of the GamePad controller. Of course, that tech defines how many people perceive the Wii U, but there’s much more Nintendo will achieve with the system. Miiverse could revolutionize how we think about and experience online interactions with other players. And because we’re developing the Nintendo 3DS release of Skylanders Giants, the Wii U’s Near Field Communication capabilities have us very excited. Would you collect a line of Super Smash Bros. figures to scan and unlock trophies in the upcoming Wii U game? We sure would! In short, whether you’re a portable game player, a console game player or a little of both, it’s a great time to be a Nintendo fan. And we’re very happy to add to the fun with games like Heroes of Ruin! It was my pleasure to interview the minds behind Heroes of Ruin. In the process of receiving this interview, I was assisted by n-Space president and co-founder, Dan O'Leary, as well as n-Space's Joshua Lynsen who organized the team's answers into what you see before you. Heroes of Ruin is available now exclusively for Nintendo 3DS. As for this site, SuperPhillip Central will have even more interviews with industry insiders and developers in the near future. Stick around and stay tuned!